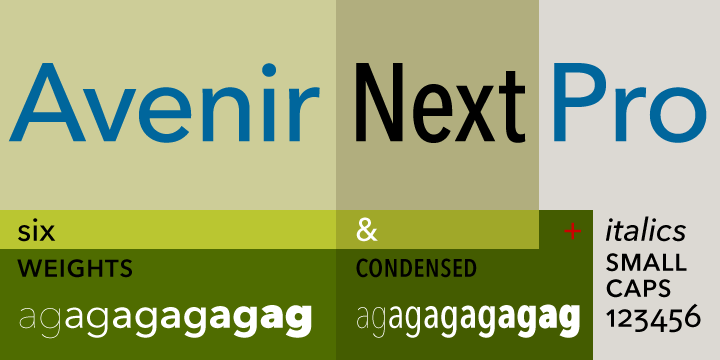 Avenir Next Pro is beautiful font was designed in the year 2004, by Frutiger with Linotype in-house type designer Akira Kobayashi. The primary motive of the design was to restructure the Avenir family and make it proficient in handling on-screen display issues. This new font was titled Avenir Next. The typeface family was then increased to about 24 fonts. Each of the font had a roman and italic version. The numbering system of Frutiger was abandoned to support more conventional weight names. Thereafter, the glyph set was lengthened to circumscribe various features such as old style figures, small caps, superscripts, subscripts, and ligatures.